Although I generally strive to eat healthy, minimally processed foods on a day-to-day basis, I’m happy to take a breather now and then to enjoy something like this Watergate salad. Considering I’d never heard of Watergate Salad before seeing the recipe in Christy Jordan’s cookbook, I was surprised to flip over a bag of marshmallows and see another recipe for it there. I must be living under a rock or something… or at the very least not in the habit of reading the back of marshmallow bags. 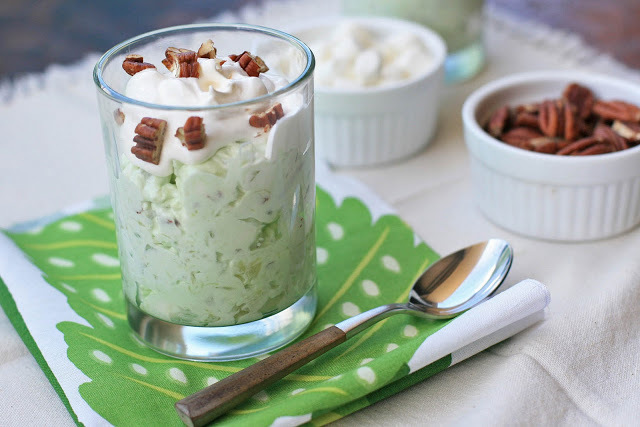 In this dish an instant pistachio pudding packet gets combined with crushed pineapple, whipped topping, mini marshmallows and chopped pecans. It’s the kind of pleasantly retro and weirdly addicting dessert that you might find at all-you-can eat buffet. Supposedly the recipe, originally called Pistachio Pineapple Delight, was created in 1975 by Kraft, but renamed after the political scandal by an unknown journalist trying to drum up interest in the recipe. Note to self: start coming up with more interesting recipe names. 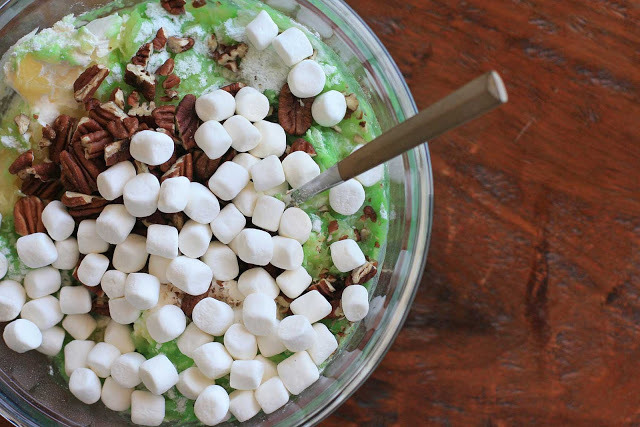 In a large bowl, combine the pudding mix, the whole can of crushed pineapple (juice and all), the marshmallows, 3/4 of a cup of the chopped pecans and half of the container of whipped topping. Stir well to combine thoroughly. Chill before serving. Spoon into individual dessert bowls or glasses and top with a dollop of the remaining whipped topping and some chopped pecans.